For anyone struggling with their weight, it can prove difficult to find ways to shed the pounds and obtain a healthy, desirable figure. For many individuals, eating right and exercising isn’t always enough. Not being able to lose weight after switching to a different diet and exercising regularly is extremely disappointing, not to mention it still leaves the individual dealing with the medical ramifications of obesity. That is why the gastric stapling procedure is performed. This is designed to reduce the size of the stomach, which reduces the amount of food a person is able to eat. All of this allows the person to lose weight and obtain the desirable body image they want. With the procedure, the doctor is going to open up the individual in order to gain access to the stomach. 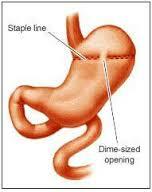 Once the stomach is accessed, the doctor basically reduces the size of the stomach by stapling a section of it off. The internal section of the stomach is closed off, which can reduce the size of the stomach often by greater than 50 percent. The actual size of the partitioned section of the stomach is usually discussed with the patient before they go into surgery, in order to make sure the right amount is stapled off. Once the surgery is complete and the incision area is sewn up, the individual is going to immediately find that they no longer are as hungry as much. However, it is important for the person to still receive the same daily nutrition. This can become a problem if some people do not have a planned diet ahead of time. Taking supplements in order to provide the required minerals and vitamins is usually necessary and there are other ways to obtain the required protein as well. However, they should start to see a noticeable drop in their weight.